To pay an employee in advance, a 'pre-pay' option is available within BrightPay. 1) Within the current open pay period, click 'More' on the menu toolbar, followed by 'Pre-Pay Following Week/Fortnight/Month/4-Week/Quarter in this Week/Fortnight/Month/4-Week/Quarter.. '. 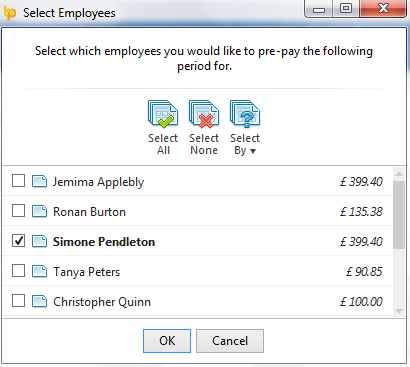 2) Select the employee(s) you wish to pay in advance and click 'OK'. 3) In the current open pay period, click the on screen alert 'Go to Following Week/Fortnight/Month/4-Week'. 4) Pre-Paying more than one period - should you wish to pay an employee or employees more than one pay period in advance, within the pre-pay period, simply click More on the menu toolbar, followed again by 'Pre-Pay Following Week/Fortnight/Month/4-Week in this Week/Fortnight/Month/4-Week.. ' and repeat the same process. 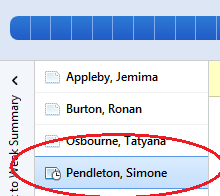 5) To finalise your pre-pay periods, return to your current open pay period by selecting this on the schedule bar. A confirmation message will appear to state that that this is a 'pre-paying payslip' and will confirm the future pay periods that will be included on the payslip. 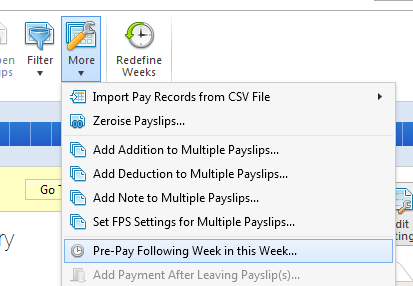 Simply click 'Finalise Payslips' to update the current period as well as the pre-pay periods. Any pre-paid period will subsequently be blocked from editing when this pay period is selected in the payroll. 1) Select the pay period in which the pre-paid payslip was included. 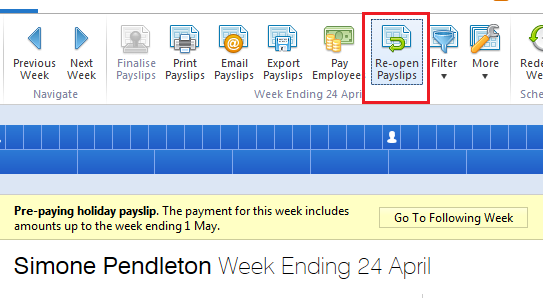 2) Select 'Re-open Payslips' on the menu toolbar, tick the employee in question and click 'OK'. 3) Now select the pre-paid period you wish to undo on the schedule bar and click 'Undo Pre-Pay'. Click 'Yes' to confirm you wish to undo this pre-paid payslip. The pre-paid period is now undone. 4) Return to the pay period in which the pre-paid period was originally included and finalise accordingly.